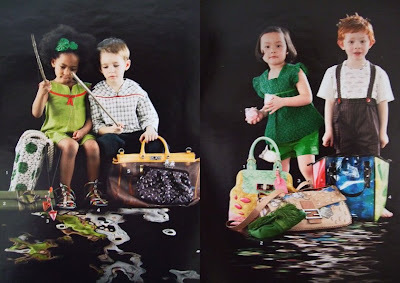 As children nowadays tend to mature at earlier and earlier ages, its no wonder the fhasion industry tried to play its card and bet on fashion for the little ones. The photos are from an old magazine I found these days and thought they were quite inspired. I took photos of the pages instead of scanning it properly, so that would explain the blurriness. Putting a child next to some high-end designer creations is such a contrast! The child will have no idea of what he/she has near him, thus he will not be able to appreciate its value. And here comes the funny part. For kids, everything is evaluated as being at the same level. A piece of ordinary cloth might as well be, in his eyes, the same as a Valentino red dress. So, what do we learn from that? To appreciate things at their right value. To enjoy simple things. 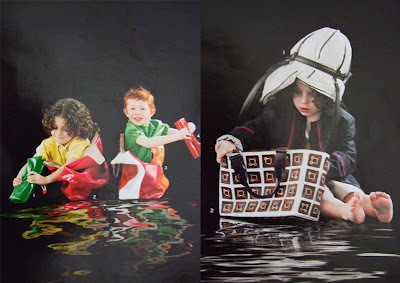 It is very common for designers to launch additional lines which focus more on kids clothing. This type of collections aim at, of course, the parents, namely the mothers. Who are the most likely to appreciate the whole concept of the mini-me copy. Dressing alike, mother-daugther, creates an evident bound between the two, now visible to the public. Is this a like it or a leave it? It depends on whether you want to see a smaller version of yourself when you look at your child. Or if the mother keeps it a more reasonable level concerning matching clothes, she could choose just a certain color for both of them to dress in, rather than two identical pieces, only in different sizes.